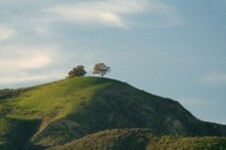 “Two Trees” is the common way to refer to a pair of blue gum Eucalyptus trees up on the hills above Ventura. One tree is part of a grove of 13 trees originally planted by Joseph Sexton and Owen Marron in 1898. “Two Trees” overlook the city and are beloved landmarks to Venturans as much as any other.